Gaza awaits truce talks verdict Jump to media player Palestinian and Israeli officials are continuing indirect talks in Cairo on a long-term truce in Gaza, as the three-day ceasefire enters its last 24 hours. Israel's military strategy scrutinised Jump to media player The BBC's Paul Adams examines the criticisms being levelled at the Israeli military, as Israel offers to extend a three-day ceasefire in Gaza. The view from the Israel Gaza border Jump to media player Israel says it has achieved its goal in Gaza of getting "quiet and security" for its people, but how do Israelis see the prospects for peace? 'There has to be giving on both sides' Jump to media player John Kerry says it is important to "make life better" for Palestinians but stressed it will require compromise on both sides. Palestinian militant group Hamas, which controls Gaza, had rejected any extension of the truce, saying Israel had failed to meet its demands. 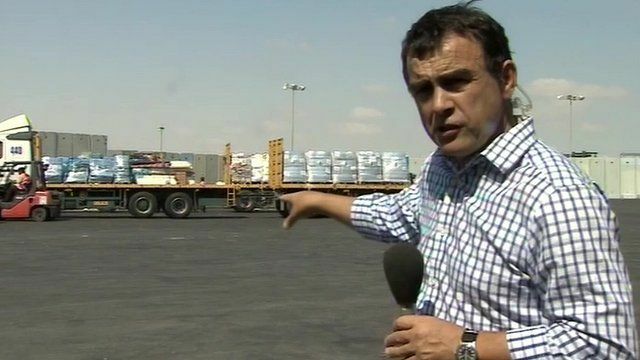 A key demand is the lifting of the blockade of Gaza - Wyre Davies reports from a border crossing.